The Israeli army forced, Saturday, a Palestinian family from Silwan town, south of the Al-Aqsa Mosque in occupied East Jerusalem, to demolish two rooms of its own home, under the pretext of being built without a permit. The home owner, Mohammad Samir al-‘Abbasi, said that he and his family had to demolish a bedroom and a living room, approximately 50 square/meters. The two rooms were built two and a half years ago, and their ceiling consisted of metal sheets. 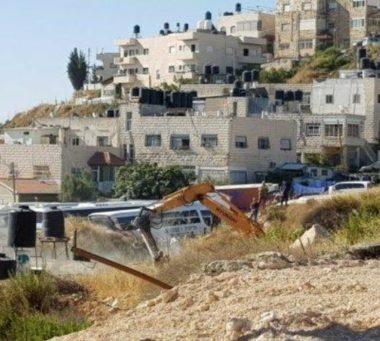 The City Council in occupied Jerusalem informed the Palestinian that he can either demolish the property at his own expense, or face high fines and fees should the city use its workers and machines in demolition the property. Last week, resident Jamil Masalma, also from Silwan, had to demolish his own home in Silwan, under the same Israeli allegations.